NEW ALBANY—Steaming bowls of pasta, antipasto salad, fresh fruit, faith-sharing and laughter were the ingredients for an inspirational and entertaining young adult gathering on a Lenten Friday in March at Our Lady of Perpetual Help Parish in the New Albany Deanery. “Pasta with the Pastor”—a young adult ministry coordinated by the New Albany Deanery Catholic Youth Ministries and hosted in March by Father Eric Augenstein—blends religious education and evangelization with friendship, social time and tasty recipes at a parish rectory. The menu on March 26 featured Pasta Santa Caterina, in honor of St. Catherine of Alexandria, and rigatoni in a cream sauce from the Cooking with the Saints cookbook published by Ignatius Press. 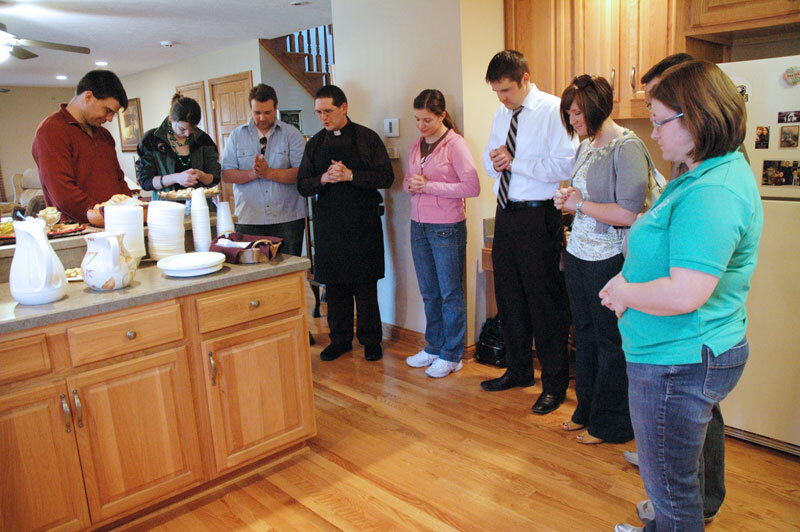 Wearing a black apron as he stirred boiling pasta and simmering tomato sauce on the stove, Father Augenstein said he enjoyed hosting “Fellowship with Father”—an evening of hospitality, desserts and coffee—with groups of 12 parishioners at the rectory during his first year as their administrator in 2007. It was a great way to get to know the people in the parish, he said, before his appointment as their pastor in 2008. Sharing faith, food and fellowship was also the inspiration for this new young adult ministry with the priests serving at New Albany Deanery parishes. This informal ministry encourages young adults to stay active in their Catholic faith, and provides opportunities for them to get to know parish priests. While the young adults dined on pasta, their conversations ranged from current events and popular culture to sports and news about friends. It was a laid-back meal for the busy young adults, and a welcome chance to relax with their Catholic peers. After the dishes were washed, they pulled chairs together in a circle and discussed “Steal Away—Time to Just Be,” the New Albany Deanery Young Adult Conference on March 6 at St. Augustine Parish in Jeffersonville. Walker serves Our Lady of Perpetual Help Parish as the director of music. A conference workshop on Lectio Divina was inspiring, Walker said, and now she also prays with Scripture. Nationally known keynote speaker and vocalist ValLimar Jansen was a dynamic conference presenter, Michelle Hoffman said, whose presentation will enhance her own duties as the coordinator of youth and young adult ministry at Our Lady of Perpetual Help Parish. Our Lady of Perpetual Help parishioner Ryan Ramsey works at an area funeral home. Several of the young adults were married in recent years, and their conversation turned to ways to keep God at the center of the sacrament of marriage. St. Paul parishioners Adam and Brittany Naville of Sellersburg said they recently presented a talk on Catholic marriage to high school students at Mount St. Francis Retreat Center. During their presentation, Brittany Naville said she discussed how “God still loves us even in our worst moments,” and that spouses must love each other like God’s unconditional love for us. Another “Pasta with the Pastor” discussion focused on the challenges of being a single, young adult Catholic. Julianna Horton, who joined the Church three years ago, ministers as the director of music and liturgy at Immaculate Conception Parish in LaGrange, Ky.
Popular culture is often negative and cynical, the young adults agreed, but faith counteracts the negativity. Jeff Jenkins, the associate director of youth ministries for the New Albany Deanery, said making time for young adult ministry activities with his wife, Cherisse, and peers helps him in his other ministries.